"It has a nice welcoming waiting area as well for my clients." 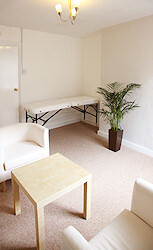 We have 3 beautiful treatment rooms to rent in our grade II listed clinic. Located in the heart of Wokingham town centre we are ideally located with public parking opposite. Just a few minutes' walk from Wokingham town centre, Denmark Street car park and Wokingham railway station. We are always happy to have qualified and experienced healthcare practitioners working from our clinic. We have room available to rent for therapy consultations. We have rooms suitable for talking therapies. We have three treatment rooms available to hire for a wide range of therapies; two with an electric couch, which is suitable for physiotherapists, osteopaths, reflexologists, etc and one therapy room available with just two chairs and a table that's suitable for hypnotherapists, counsellors, psychologists, etc. Unfortunately we don't have beauty rooms for a beauty therapist. Our consultation rooms are decorated to a high standard and offer a light, welcoming and professional treatment area for your clients. Take a look inside our clinic with our virtual tour. The ad hoc rate at our clinic is �11 per hour. Minimum use is 1 hour. Contract rates, where you take out the same hours each week (minimum of 3 hours) is £10 an hour. You can use the clinic at whatever time suits you, with 24/7 access. There is free Wi-Fi available to all therapists and the option of advertising yourself on our well-ranked website (�25 one-off fee). We use an online diary system, which you can use on your smart phone or desktop that allows you to access and book the clinic 24 hours-, 7days a week. Therapists wishing to apply to rents our space must be fully qualified in their chosen profession and have their own insurance. We do not accept any form of beauty treatment. If you are interested in renting space at the clinic, please email us.